The QS10,000 EDP Billabong Pro Ericeira continued in wind-affected surf at Ribeira d’Ilhas but the performance levels kept rising despite trickier sections to work with. Competition resumed with the remaining four heats of Round Three, went through eight heats of Round Four and finished with the first half of Round Five, the first man-on-man matchups to decide the event’s quarterfinalists. Deivid Silva (BRA) took on one of the standouts of the event so far Griffin Colapinto (USA) in the opening heat of Round Five and did not show any nerves as he destroyed the first wave of the heat. 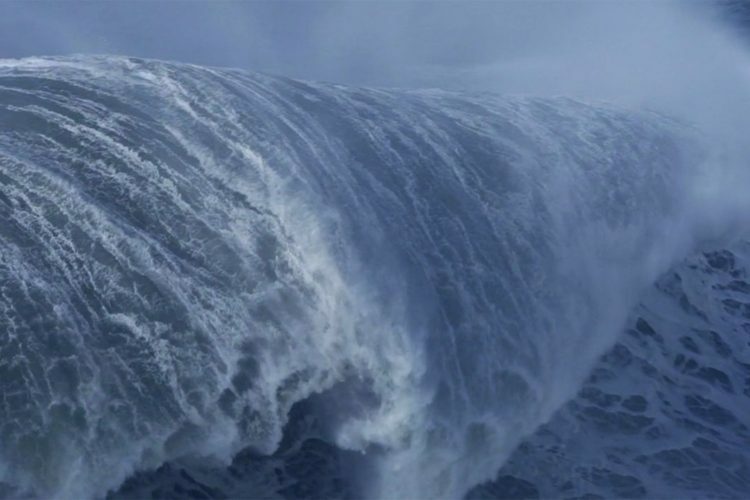 Silva’s flow and ability to fit his turns right in the lip turned in an 8.33 to apply pressure on the Californian. Silva quickly backed up his first score with a good 6.83 under Colapinto’s priority on a wider set. The current world No. 15 got back in the fight with a 6.90 on the ten-minute mark but ultimately couldn’t find the excellent score required to advance past Silva. The Brazilian with a fifth place at worst is guaranteed to climb a few spots on the Qualifying Series, overtaking at least five surfers who bowed out earlier in this event. The second heat was a bit slower between Ryan Callinan (AUS) and Ricardo Christie (NZL) and only the Australian was able to find a good wave mid-heat to go to town on his backhand for a 7.00, the highest score of the matchup. Both surfers scoured the lineup for opportunities but the job was done for Callinan on his earlier wave. The third heat featured Ethan Ewing (AUS) and Bino Lopes (BRA), two lightning fast regular footers, really dangerous on long rights. Ewing continued to be extremely selective and started with a 7.00 while Lopes started on four waves in the first half of the heat but only built on average scores. The Brazilian picked up his best wave with ten minutes remaining, a 6.53 that saw him move into first but right behind him Ewing caught the next wave and backed up his best score to re-claim and extend his lead. Lopes caught a final wave just a couple of minutes before the buzzer and surfed it really well with timely carves and a couple of snaps to finish, but his score came up just short and Ewing moved on to the quarters. The day’s final heat was a clash of goofy foots between the 2014 World Champion Gabriel Medina (BRA) and France’s Joan Duru (FRA). Unfortunately with conditions becoming increasingly difficult on the higher tide and strong side-onshore winds, the first half remained a battle of low scores. A good exchange on back-to-back waves mid-heat gave the advantage to Medina with a 7.33 over Duru’s 6.10. The Brazilian went right back to work on a slightly better wave straight after and posted another 7.63 to push the Frenchman against the ropes. That sparked a reaction with Duru who lit up a set wave to post an 8.23 but behind him Medina continued to build momentum and answered with an 8.83, leaving Duru chasing another 8+ waves with 2 minutes on the clock. 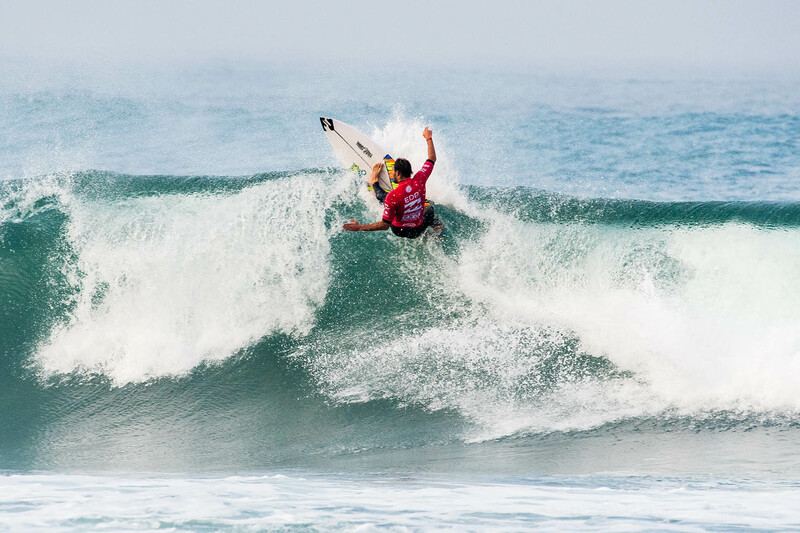 Time ran away from the French surfer and Medina advanced into the Quarters. Earlier in Round Four, Frederico Morais (PRT) blew up to post the event’s highest heat total of 17.73 but unfortunately eliminated compatriot Vasco Ribeiro (PRT) in the process.